The Luce name had traditionally been applied to larger Mazda rear wheel drive luxury sedans, until a coupe variant was developed in 1969. Styled by a partnership with the Italian design firm Bertone, the attractive a smartly styled coupe looked more European than like anything in Mazda’s line. Initially the Luce was available in one of two four cylinder models: a 1500 or 1800. The most attractive variant, the coupe differed from the sedan due to its use of a 1.3 L rotary engine driving the front wheels (the only front drive rotary Mazda). With front disc brakes and 126 hp, the R130 was quite the performance bargain, if you could find one. Although not a limited edition car, it was rare, with only 1,000 or so cars produced through its run of four years. Wankel rotary engine development had been going on at Mazda since the early 60’s and was used on sportier cars. The Luce coupe was the perfect platform, coming in two models. The broad appeal of it’s European styling meant that it sold well in Japan in the few export markets it was available in where it was sometimes called Mazda Bertone 1500 or 1300. Although not a limited edition car, it was rare, with only 1,000 or so cars produced in its production run of 5 years. 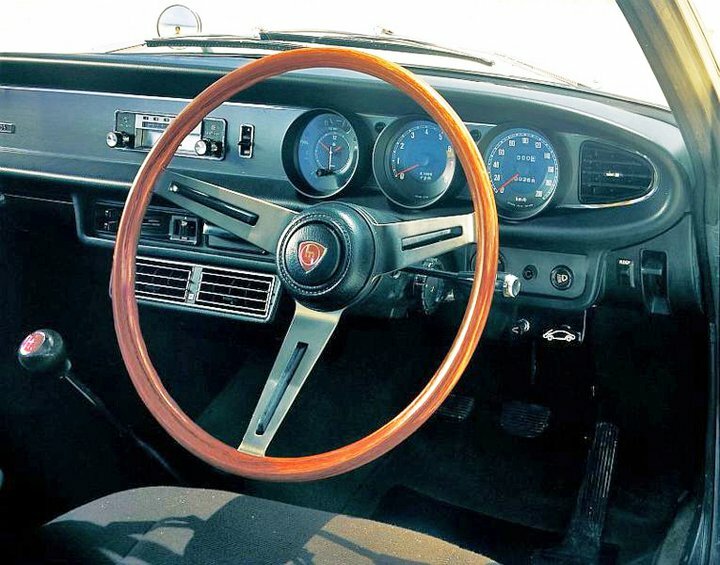 The European influence continued inside with a wood steering wheel and a fully instrumented dash. Other nice touches included declinable bucket seats, lockable glove compartment and retractable radio antenna. The no nonsense Japanese efficiency of the interior worked well with the Italian flair, making the Luce something of a performance and luxury bargain compared to all the Alfas and Fiats of the world. Technically the R130 was technically advanced, no doubt showcasing the emerging Japanese company’s technical abilities. The Luce R130 set the stage for future high volume Mazda rotary powered coupes like the RX4 of the 70’s and the legendary RX7. The Luce range continued up to 1990, being sold as the Mazda 929 in the United States. The immediate successor to the R130 called the R1800, was one of Mazda’s first cars sold to the US market in 1970. It was a flop here, but sold well in Europe.